One unforeseen consequence of writing about Tesla Inc. is that I felt compelled to start following Kanye on Twitter this week. A few days before Mr. West got around to his musings on “dragon energy”, he praised both his Tesla vehicle and the electric car maker’s CEO, Elon Musk. I half expected Tesla’s stock to acquire a little dragon energy of its own from that. But as of Thursday morning, it was down about 2 percent this week. Rather than impugn Kanye’s powers of influence, let’s put it down to timing: It is just tough to bid up Tesla heading into next Wednesday’s first-quarter results. Because they’re almost certain to be awful. Is that even an issue, though? After all, the stock usually displays more correlation with dragon energy than earnings, and has already sold off as evidence of Tesla’s manufacturing problems has mounted. But those numbers due May 2 matter. Here’s why and what to look for. We already know Tesla’s gross profit margin is likely to be dismal. 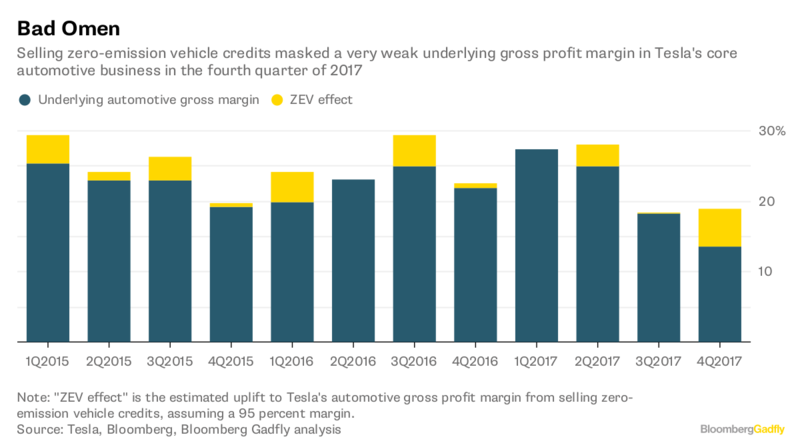 That’s partly because of the Model 3’s production hell, but it has more to do with the sharp drop in sales of the Models S and X.
Tesla’s underlying automotive gross margin in the fourth quarter of 2017 was less than 14 percent after stripping out the top-up provided by selling a slug of zero-emission vehicle credits (see this for an explanation of those). A 23 percent drop in deliveries of Tesla’s higher-margin vehicles won’t help to turn that around. Meanwhile, Tesla would be lucky to have earned a single-digit margin on the Model 3, which topped up the unit numbers, given its lower price point and problems. It will be interesting to see if Tesla sold any credits to offset this. This, in turn, doesn’t bode well for cash flow. Tesla actually generated positive cash from operations in the fourth quarter of about $510 million. As I wrote here, though, virtually all of that was due to a big shift further down into negative net working capital. Pulling levers like running down inventory – notice how Model S and X deliveries peaked in the fourth quarter before dropping –isn’t sustainable. At a very high level, the drop of about 6,500 Model S and X sales, at an assumed price of about $100,000 each, offset somewhat by the extra Model 3 sales (assuming they were high-priced versions fetching about $50,000 apiece), adds up to a headwind of around $320 million. Plus, these sales won’t enjoy the extra boost to cash flow provided by those fourth-quarter sales from inventory. 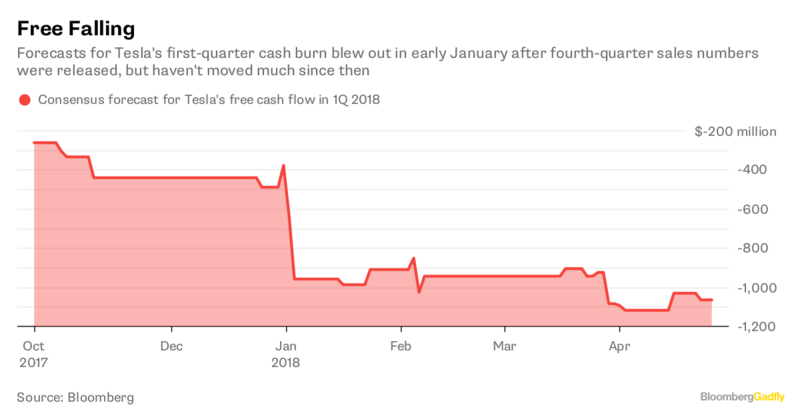 Remarkably, the consensus forecast for Tesla’s cash burn in the first quarter has expanded by only about $100 million since early January, to $1.06 billion. While that alone would wipe out roughly a third Tesla’s bank balance, the risk is to the downside. The same could be said for the current quarter. One of the things that helped stabilize Tesla’s share price this month was a leaked email in which Musk announced a move to “24/7 operations” to get Model 3 production up to 6,000 a week by the end of June. Investors initially latched onto the higher target and the apparent can-do spirit. But the benefits look less impressive when you consider any numbers below the top line. Prior to the email, Tesla’s guidance was to get to 5,000 Model 3s a week. Assuming two eight-hour shifts for five days a week, that would imply about 63 cars eventually rolling off the production line every hour, or just over one per minute. Taking the email at its word, Tesla now targets 6,000 a week, only with the line working 24/7. Factoring in time for maintenance, let’s say that means six days a week, each with three eight-hour shifts – or slightly less than 42 Model 3s an hour. More cars, yes, but at the cost of implied productivity dropping by a third. That suggests another quarter of weak margins and high cash burn could be in the offing, especially as reconfiguring the production line to deal with its “excessive automation” isn’t likely to come cheap. Little wonder Musk announced stringent cost controls in the same email. So it seems even more likely that Tesla will need to return to the capital markets this year to replenish its bank account, despite its (caveated) claim to the contrary (I laid out the math here). News of another senior executive leaving – the head of Tesla’s Autopilot assisted-driving effort – may have helped nudge it up a bit further on Tuesday. But the pressure on margins and cash flow provide the essential, and consistent, narrative here. Even Kanye can’t compete with that.